I met Alvaro after my return from Baylor University in Texas, early in 1968 where I majored in Biology, while registering for my first graduate course at Universidad de Costa Rica. We bore good heads of hair, then, while Alvaro also wore a beard. Soon he had befriended my whole family, including my grandmother whom he nicknamed Mariquita, my brothers Moi and Samy. 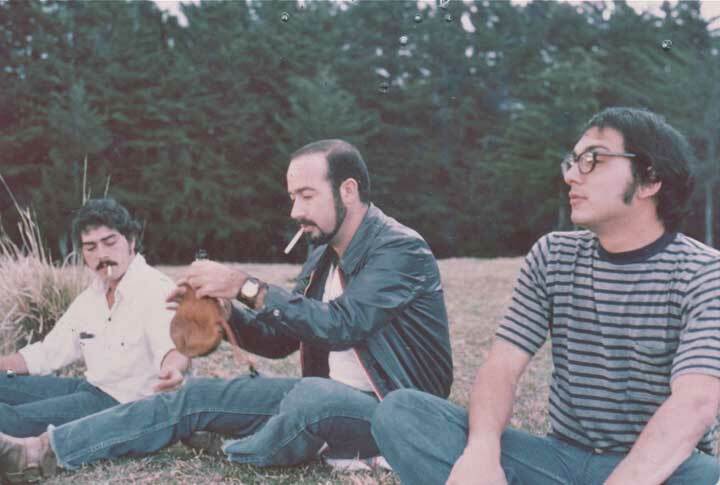 A photograph from those early days shows the three of us (including Moi), partying in the hills of Heredia, drinking wine from a bota española (Photo included. As photo shows, both Alvaro and Moi smoked tobacco; a habit they both eventually dropped). We were soon taking advanced biology courses with Doug Robinson, Rafael Lucas Rodriguez, Bill Bussing, Luis Fournier, Alvaro Wille and other members of a very fine cohort of scientists in the school of biology. We often studied together for exams, and developed a drilling system to guess the exam questions, which usually allowed us to get the best grades in the class! In the fabulous entomology course we took with Dr. Wille, two biologists in a sea of agronomy students, we collected and pinned down the best insect collection (a requirement for the course), including an Epiperipatus which Alvaro collected and made the best grades, so that Prof. Wille exempted us from the final exam, which made the agronomy students really pissed. During these early days, we both discovered the amazing diversity of living creatures in Costa Rica but still were not sure what we wanted to do for our careers. One fine day Alvaro showed me a letter of invitation that Mario Boza had pried from the US Forest Service for a course offered by the US National Park Service. Alvaro wondered what I thought about his going for several weeks to a course in a National Park. I encouraged him to go (¡Ni lo pensés! ), which he did. He came back as a transformed man. If anything shook his brain, as far as I recall, it was this exposure to the concept of protected lands, pristine forests and ecosystems protected from humans, for the future and for their own value. Alvaro returned a changed man. All of a sudden he had found his Norte, and with his usual passion was soon involved working for the newly hatched Costa Rican national parks, that would soon become consolidated under the Sistema de Parques Nacionales y Áreas Afines. Before I knew it, Alvaro was the Park Director, moving and leading a national effort that only started in the 1970s, but due to his clarity of vision and direction, he had become recognized as one of the best in the world. Alvaro always knew where to go next; the essence of a true leader. He spearheaded the creation of Corcovado by Oduber, with the help of Minister of Agriculture Rodolfo Quirós. He supported Mario Boza in the creation of Amistad when Carazo was President. He pushed for the creation of many other protected areas including Parque Nacional Cahuita, where he personally faced the community in a cabildo abierto. Many decades later, after he had retired from the Ministry, one fine day Alvaro invited me to San Ramon, for yet another project he was cooking. I can’t recall the exact date. He told me to wear boots and field biology gear since we were walking into a rain forest. Just like in the old days as students we geared up, always ready to catch the frog and turn rocks for insects and other bichos. We drove past San Ramon into an awesome cloud forest, wet and evergreen; each tree a whole microcosm of epiphytes, bromeliads, orchids, diverse herps and very muddy paths into the forest. We walked into the forest that seemed untouched: large and ancient hardwoods still in place — for sale at a bargain price. Why not a private effort to protect it? After all, working with the government can be so frustrating at times. So, before we got lost in the forest that day, as it was so easy to do before landmarks were established, it dawned on me that Alvaro was on to another project. He told me about his friends Evelyne and David, which I would like for sure, “cause they are molecular biologists!” After we managed to find our way out, no thanks to my efforts, Alvaro asked me what I thought. I said “I approve!” He said “That’s good because I want you to be on the Board of Directors!” I have been on the Board of Nectandra Institute since then and feel it is a privilege to be part of it. I profoundly admire its members including our dear Ann Gallie, for whom I hold a profound admiration. It was a huge privilege to know Alvaro for so many years and to share as a friend in so many battles. I always learned from him. It was also a privilege to share our families and friends through decades of friendship. And, of course, it was a fortune to share ideals and ideas with him. I celebrate the life of Ann and Alvaro and thank them for sharing their time with those of us that are still alive. It warms my heart that they lie together under the shade of the big garlic tree in Corcovado. Makes me want to join them there when my turn comes.